What is a project management audit? Jennifer Bridges, PMP, explains and shows you in a few simple steps how to do one yourself. Jennifer opened with a definition of the word audit; in its general sense, audit is a verb that means to inspect, examine, check, assess, review or analyze. Now that is not so different than what a project manager does all the time, she added. We’re constantly auditing the health of our project, its financial well-being, the schedule and our timeliness in completing it, as well as the equipment and tools we’re using in the project. Why do we do this? Well, for many reasons. One, it helps to understand where we are compared to where we should be in the project. Auditing lets us know if things are okay and are performing as planned. It also tells us if we’re safe to go on and if things are improving. A project management audit is a bit different than the general definition of audit. First off, in this context, it’s a noun that means an independent, structured assessment. The audit process is designed to determine the status of work performed on a project to ensure it complies with the statement of work, such as the scope, time and budget of the project, along with the maturity of the project management process. Why Do a Project Management Audit? One of the main reasons to do a project management audit is to ensure that you’re compliant with whatever governing regulations your project is subject to, depending on the industry, such as HIPAA, GDR, FAA, FTC, etc. It also helps to find gaps or reasons for any project failures or errors. On the flipside of this, it will also discover any areas for efficiencies concerning time, money and effort. But you must know your specific objectives, as they are not necessarily the same from project to project and organization to organization. There are many questions to consider during an audit, such as, why are you engaged in the project, and what results are you seeking? The project management audit at the top level asks, who does what, when and where, and how can it be improved? Well, improvement always comes through process. By going through each task and auditing it, you can begin a thorough audit of the entire project. What Kind of Prep Do You Do for a PM Audit? First, you create a process and use a document repository. Then, use a template/checklist and track the work with a tool that allows you to attach documents to tasks/milestones. These will serve as your artifacts or evidence or proof that Jennifer was referring to. Plan the Audit: You shouldn’t start anything without a plan. Let everyone involved in the audit and the project know about the audit, and stress that this is not anything scary. It’s a method to make things work better, not lay blame. Conduct the Audit: Now do the audit and work through a thorough process to get all the data and proof. Summarize the Audit: At this point, you’ll have lots of data; so take these findings about improvements and faults, and put them in an executive summary to give a clear and broad overview. Be sure to point out and praise those who have done well. Present the Results: Next, you want to present that summary of results to all parties that need to know about the audit, from your team to your stakeholders. Determine the Action Plan: With all this data, you can now develop a plan of action that will help improve efficiencies. Get people involved and set that course with assignments and due dates. Schedule Follow-Up: Don’t let this action plan go unattended. Go back to it and make sure that the plan is progressing on schedule. Repeat: This is a list that should really be designed in a circle, because you can never sit back and become complacent. The more audits you do, the more efficiencies you’ll create. Pro-Tip: A project management audit is a critical method of making sure that you’re running the tightest project possible. But there are other complimentary ways to help with project efficiencies, such as hiring a project analyst to work with the project manager to help perform analytical tasks. 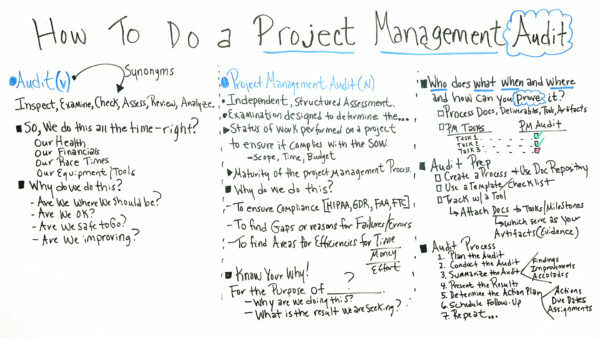 Today we’re talking about how to do a project management audit. So in this whiteboard session, I wanna talk about what an audit is, clarify what a project management audit is, and why we do it, and then give a few simple steps on how to get it done. Well, first of all, an audit is a verb. So some synonyms that we hear all the time is inspect, examine, check, assess, review, and analyze. So the reason I wanna talk about this is because sometimes people think an audit is so scary, especially like a project management audit. What are they gonna find? Well, we do this all the time, right? We do it with our health. We wanna make sure is our health getting better? Is our blood pressure getting better? In our financials, are our financials increasing? Are they decreasing? Also, people on athletics, they check their race times all the time. Maybe even musicians check their tools or their equipment, or even race car drivers, they check their equipment, right? So we do this all the time. But why do we do it? We’re trying to identify are we where we should be? Are we okay? Are we safe to go? And are we improving? So we do this all the time. So let’s relate it to the project management audit. So a project management audit is a noun. It’s an independent structured assessment. It’s an examination designed to determine the status of the work performed on a project to ensure we’re meeting the SOW, which is the statement of work. We’re looking at the scope, the time, the budget. We wanna make sure what we’ve committed to we’re actually producing. It also can look at the maturity of the project management process. So why do we do the project management audit? Well, in some cases, we wanna make sure we’re complying. There are things in healthcare like HIPAA. Now, with people working with data, there’s the general data requirements and even the FAA and the FTC. So depending upon what industry, there may be things that you have to comply with in your project. We also wanna find any gaps or reasons for failures or errors. And then we wanna find areas of efficiencies to improve the time, improve the money or decrease expenses. Maybe we even wanna decrease the effort. So before you start your project management audit, then know why you’re doing it. We are doing this for the purpose of what? So you can be clear that you know why you’re doing this, and more importantly, what is the result that you’re seeking? So what do we look at? So basically, at a high level, we’re checking out who does what, when, and where, and how can you prove it. So in the audit, we may be looking at process documentation, deliverables that are produced, maybe even tools that we use to track it, and the artifacts. So the artifacts are actually the proof. So we can look at the project management task, and the audit is looking at these tasks were supposed to be done or these deliverables were supposed to be produced. So were they. So we always wanna prep before we do the audit. So here are some of the things just at a high level we wanna make sure that we’re prepped and ready for. We wanna create a process, a process for the audit. And we also wanna use a documentation repository for our projects. Because that way, when we’re using the process, we can go to the repository define documents, deliverables, and artifacts. We also wanna use a template or a checklist. So we ensure that we haven’t missed anything and to also ensure that we have a documented repeatable process. We also want to track this with a tool. So the great news is, with software tools today, we can for the different tasks that are being performed by the project manager or the team member, they can attach documents to specific task or milestones. That way the artifacts or the evidence is right there in your project plan and in your tool. And so here are just, again, some very high level steps for an audit process. So first of all, you want to plan the audit. So let everyone know who is involved in the audit or in the process or the project. Give them a heads up that this is going to be done. And again, it’s not a scary thing. It’s not to make any one wrong. We’re trying to improve things. So we want to conduct the audit actually go through the process of the audit by doing the things we’re looking at doing. Then I think it’s important to summarize the audit. What were the findings? What improvements did you see, had occurred, or what recommendations for improvements do you see could be done? And also, I like to give accolades. When people improve processes, I like to encourage them and let them know that they’re actually doing things better. Then we wanna present the results to the team, the stakeholders, or the people who need to know. And then number five, determine the action plan. So from the findings or improvements that you see could be made, you want to be sure to put a plan around that so you know what actions need to be done, when they need to be done, and who needs to do it. And then schedule the follow up and then you go back and you rinse and repeat. You actually do it again. So that’s continuous improvement. And you can see that that’s very valuable to not only the project but the organization and the team. So if you need a tool that can help you with your project management audit, then sign up for our software now at ProjectManager.com.